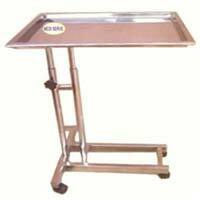 S.S. tray size: : : 76x40 cm. 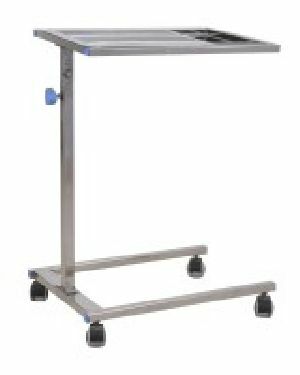 Wholly made of stainless steel.Adjustable height manaully suitable to use over the operation table.Mounted on four castors. 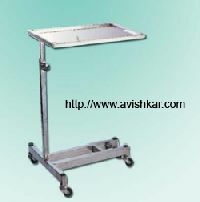 Frame Work of Mayo Instrument Trolley is made of Rectangle tube. The Frame has single support. The body section is mounted on 5cm castors . The Height is adjustable with side Knob. 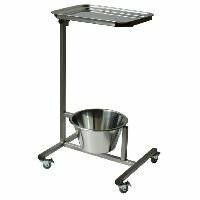 Mayo's Trolley Stainless Steel Frame work S.S. rectangular tubes mounted on 5 cms castors, height adjustable by side knob, Tray Size S.S. : Approx: 56L x 40W cms . Tray size : 48 x 33 cm. 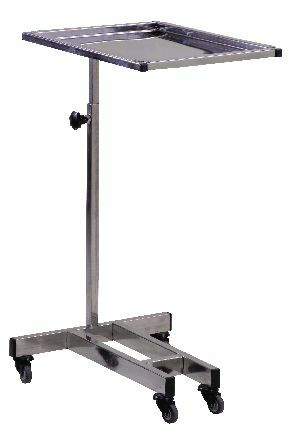 MAYO'S INSTRUMENT TROLLEY Frame work made of CRC tubular pipe mounted on four 7.5 cm. dia. castors. 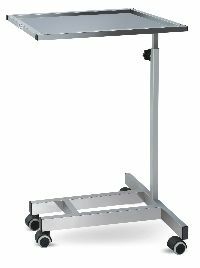 Height adjustable from 76 to 127 cm. Pre-treated and epoxy powder coated. Also Available in Stainless Steel. Mayo trolley Rectangular CRC tubes mounted on 5 cm. 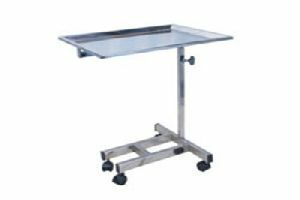 Casters, Height adjustable by gear handle, Epoxy powder coated.Mayo's Instrument Trolley with S.S. Trolley. 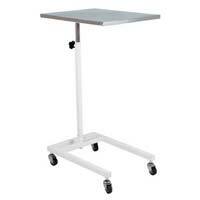 Stainless steel tray, Epoxy Powder Coated Stand with adjustable height with knob, heavy base with castle wheel. Trolley Mounted on 50 mm dia. wheels. 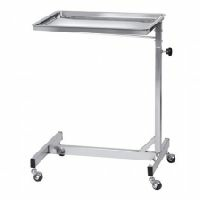 Available in full stainless steel /Powder coated frame with stainless steel tray. 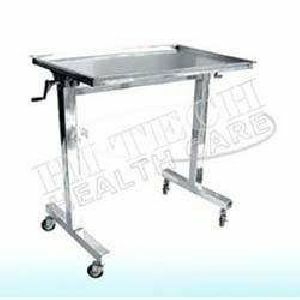 Mayo trolley, Height adjustable, tainless steel tubular structure with, Removable S.S. tray, Height can be adjusted with the, telescopic movement. 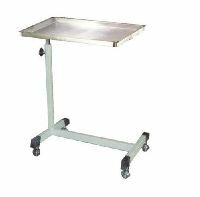 Tubular Steel Structure with Stainless Steel deep tray, Height adjustable with the help of telescopic S.S. Tube, Size: 560 x 405 x 810. 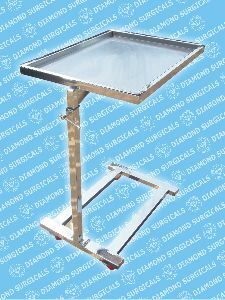 Tray size : L555mm x W430mm Ht. 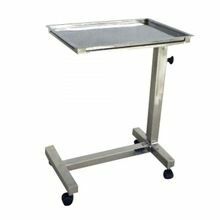 Adjustable Stainless steel square tubes Frame : Stainless steel rectangular & square tubes Features: Trolley mounted on 50mm dia wheels. 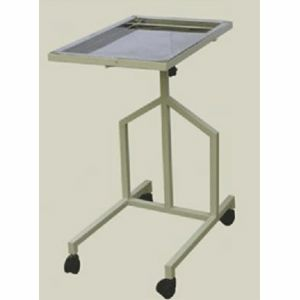 Available in full stainless steel powder coated frame with stainless steel tray. 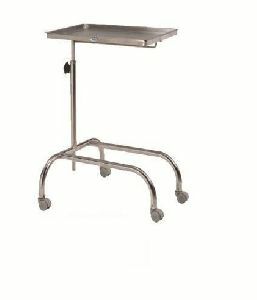 Instrument Mayo Trolley over the OT Table These trolleys are used for carrying medical instruments and medicines that include scissors, cotton, forceps, syringes and others. 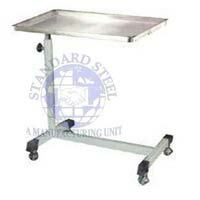 The entire trolley is mounted on movable casters of 10 cm diameter. Their height can be adjusted using a gear handle. 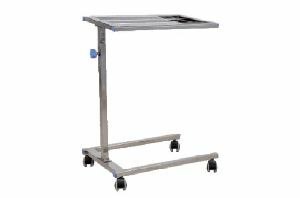 These trolleys are available in S.S. frame and tray. 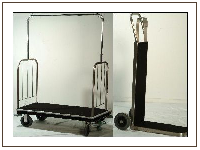 Trolleys are powder coasted using epoxy paints. 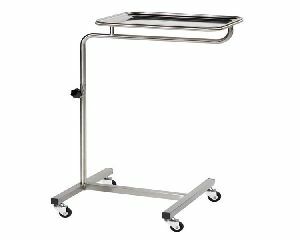 We are offering Mayo Instrument Trolley. 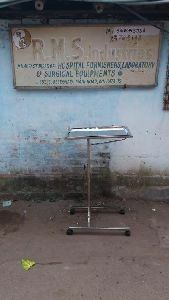 (Mayo trolley) • Mild steel tubular frame work. 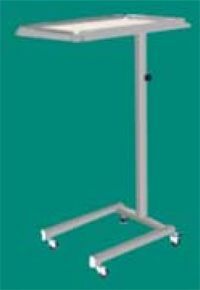 • Mounted on 50 mm swivel castors. 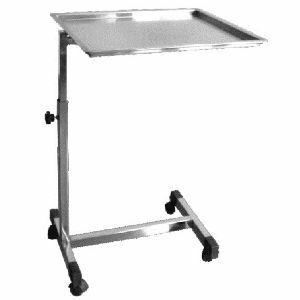 • Stainless steel tray. 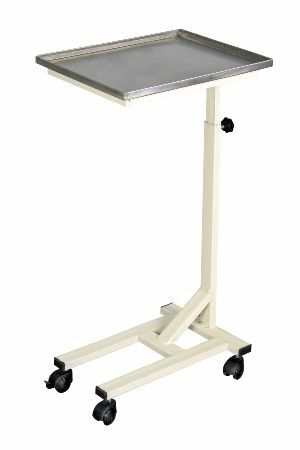 • Manually adjustable height. 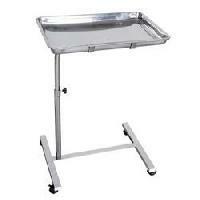 • Tray size: - 550(L) x 400(W) mm. 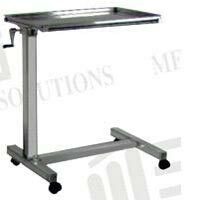 • Height adjustable - 750 to 1250mm. • Epoxy powder coated finishing. 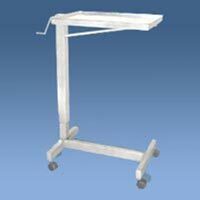 We are offering mayo instrument trolley - medical equipment. 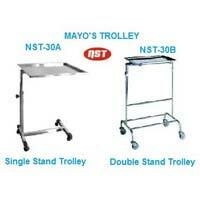 We are well known for supplying of wide variety of Mayo Trolley. 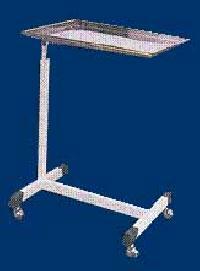 We “Lotus Biomed” are one of renowned manufacturers of hospital furniture and all related good. 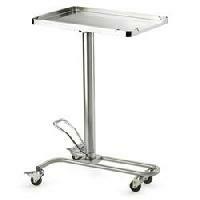 The product Mayo Trolley is one out of our specialized product. 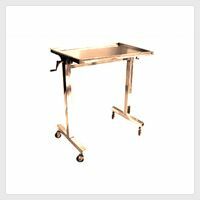 Offered Mayo trolley is manufactured utilizing supreme quality raw material in accordance to the universally accepted quality standards.